How Successful Was Your Sponsorship Event Email Invitation? In our previous blog post, Best Practices For Sponsorship Event Invitation Emails, we discussed best practices for successful email invitations when organizing a sponsorship event. But sending the email invite, even if it’s perfectly optimized, is just not enough. It’s equally important to read the metrics, learn from them, and improve. Choosing the right subject line, experimenting with formats and CTAs can often drastically affect your conversion rate and attendance, but how will you know what works? The answer is simple: metrics. Today’s digital tools offer vast amounts of data, but that data is meaningless if you don’t no how to read it. We will use our EventHub tool to give you an example of how simplified yet relevant data can work for you. 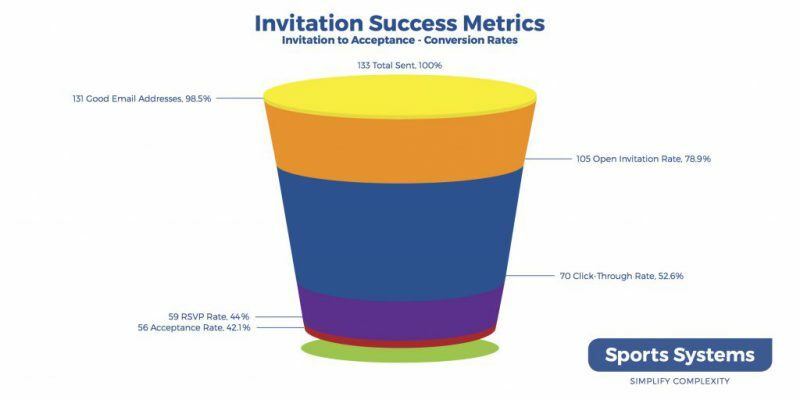 Our Invitation Success Metrics will help you understand the challenges and successes of your campaigns, and ultimately calculate the ROI of your sponsorship event planning efforts. Yellow indicates how many bad email addresses there were in the batch that was sent. The larger the list, the more likely it is that you will have some emails bounce or remain undelivered. There are several reasons for this. It could be because the person is not using the address anymore, is not at the company anymore, or their address is invalid. Sometimes, there is a typo in the address, so you should double check your lists. On rare occasions, errors could be caused by a policy block by the recipient’s email system. Orange represents invitations that went unopened. Success here is a high ‘Invitation Open Rate‘. There are a few reasons that emails are not opened. People often ignore emails that are not of high importance to them, people often won’t open an email from unknown senders, or the email has landed in some other folder. While you can’t directly affect the behavior of people, you can use best practices to decrease your unopened rates: send from a trusted sender/source, and compose a compelling subject line that will motivate or incentivize people to react and open the email. Blue represents invitations that did not follow the call-to-action and did not click through to the event website. Success here is a high ‘Click-through Rate‘. These sports event invitations were opened, but were not successful in influencing the recipient to follow the call to action and click through to the event website. Getting people to open your email is only half the job. Your main goal is to make recipients click your CTA, visit the desired landing page, and interact further – in this case RSVPing. If you want your CTA to be successful and improve your sponsorship event planning efforts, make your CTA prominent, clear and actionable. <pPurple represents people that clicked through to the event website, but then did not register or they declined. Success here is a high ‘RSVP Rate‘. Red represents the invitations that were declined. Green represents the acceptances, so success here is a high ‘Acceptance Rate‘. Some recipients who click through to the event will return and RSVP on another day, others will simply not return. The more you show the value of attending the event, the greater your chances of a positive RSVP. Tell them what the event is all about in the first sentence, and don’t forget to highlight the time and place. Remember, the most important things should be stated first and accentuated with headlines and larger fonts. You increase your sports sponsorship event ROI by having more top priority invitees attending. EventHub will simplify the complexity for you by providing easy to comprehend metrics and offering best practices and ideas to reduce fallout and increase your critical final acceptance rate.